This article is about the stage in Super Smash Bros. 4. 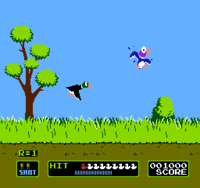 For Duck Hunt in other contexts, see Duck Hunt (disambiguation). Duck Hunt across the Smash series. Unlock criteria KO one opponent in Cruel Smash. In Super Smash Bros. for Wii U and Ultimate, Duck Hunt is fought here in their unlocking battle. The main body of the stage is a large dirt platform covered by grass, whose sides can be wall jumped off of. The bush on the right and the foliage of the tree on the left act as soft platforms. Occasionally, a patch of grass may pop up in front of the main field of grass, which hides characters and items behind it due to the stage's 2D effect. The look of the stage is based on the game's native 4:3 aspect ratio, with the side blast lines being located beyond the pillar-boxes on either side of the main platform. 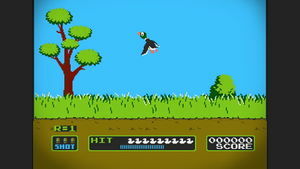 The HUD displayed on the screen during play shows the round number, the quantity of ammo left, a duck meter, a gauge below the duck meter indicating the minimum amount of ducks to knock down, and the current score. The HUD in the standard version of the stage in Super Smash Bros. for 3DS moves with the camera. During the match, one or two ducks appear at a time. They plunge into the grass when hit by an attack, increasing the score and occasionally dropping items. The 8-bit dog then appears to collect the fallen ducks or laugh if no ducks were hit, concurrently acting as a temporary platform. If players knock down the minimum number of ducks to move on to the next round after ten ducks appear, then the next round begins. Green ducks give 500 points, blue ducks give 1,000, and red ducks give 1,500. If all ten ducks are knocked down, a "Perfect" sign is displayed in the center of the stage just as in the original Duck Hunt, adding 10,000 points to the total. If the minimum quota is not met, it will restart from the first round. There are 10 rounds in total, with a maximum potential score of 158,000, before the score resets to zero and it resets to the first round. In 8-Player Smash, no ducks or dog appear at all. In Super Smash Bros. 4, the Ω form removes the bush, the ducks, the dog, the tree, and the patches of grass the player can hide in. Additionally the platform is shortened slightly to match that of Final Destination. However, the HUD remains fixed and does not move with the camera. In Super Smash Bros. Ultimate, the Ω form and Battlefield form are similar to SSB4's Ω form; however, the main platform does not extend below the blast line and is resized and reshaped to match Final Destination and Battlefield, respectively. The three soft platforms of the Battlefield form resemble the texture of the ground and are unique to this form. The characters are still flat, which also flattens the hitboxes and alters gameplay significantly as a result. 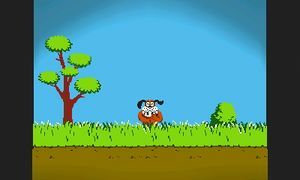 The stage as it originally appeared in Duck Hunt. 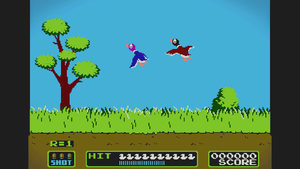 The stage is based on the original Duck Hunt game for the NES. In the game, players use the NES Zapper light gun accessory to shoot their targets down. Players must choose to play either Game A, B, or C. One duck appears at a time in Game A, and two ducks appear at a time in Game B. In Game C, players are tasked with shooting clay pigeons which are tossed from the foreground to the background. This stage combines both Game A and B, as either one or two ducks will appear at a time. Prior to 2017, this stage was legal in most tournaments, however, the 2017 recommended ruleset has made this stage banned in tournaments. Several reasons behind this ban was due to the singular tree which promoted camping against characters with poor vertical movement (most notoriously Little Mac), the low distance relative to the stage and the bottom/side blast lines, and infamously the Duck Hunt dog itself who would occasionally interrupt gameplay (or even save a player from a punish). However, arguments against the stage's ban included the relative neutrality of the main platform and advantages offered by the tree, allowing it to be used as a counterpick stage for characters with otherwise weak vertical finishers. Additionally, the ducks could be used as a technical advantage due to their ability to refresh stale moves, similar to hitting balloons on Smashville. Overall, this decision has been met with mixed reception, with one notable example of opposition being from ESAM, who has made a video addressing his feelings on the subject. Duck Hunt taunting on its eponymous stage in Ultimate. Star KOs and screen KOs occur in the 3DS version, but not in the Wii U version. This is also the case with the 3DS version of Super Mario Maker, though without the Screen KOs. Although the fighters are 2D, the ground, tree, bush, and moving grass sections have raised 3D parts. In Super Smash Bros. for Nintendo 3DS's All-Star Mode and Super Smash Bros. for Wii U's Duck Hunt unlock battle, the stage's dog and ducks do not appear. This is the only shared stage in Super Smash Bros. 4 to have an alternate track on the 3DS version that does not appear on the same stage on the Wii U. Certain fighters benefit from the lack of a Z-axis for hitboxes in this stage, for example Charizard, who has a much easier time landing the sweetspot on its forward tilt as a result. Even if Super Smash Bros. for Nintendo 3DS is updated to 1.1.1 or higher, Duck Hunt will still be fought on Battlefield for their unlocking battle instead of here. Duck Hunt is one of two stages that has been a starter stage, an unlockable stage, and a DLC stage, as it was each in Ultimate, Smash Wii U, and Smash 3DS, respectively; the other is Dream Land. This page was last edited on April 16, 2019, at 07:40.